* Past Events * FREE desktop wallpapers! * Newspaper and Media Coverage for our Nonprofit Org. * Help Us Promote the Biltmore * Preservation Org. * Vintage Biltmore Print for Sale, Red Roof!! * Projected move December 20 and 21, 2016 was a success!! The remaining historic portion of the 1896 Belleview Biltmore Hotel was successfully rotated and moved 320 feet on Wednesday December 21, 2016 and was renamed the Belleview Inn. It will be the center piece of Belleview Place, a residential development by JMC Communities. Prior to this move, demolition and destruction of the rest of the North and South Wings including the beautiful Carriage and Tiffany rooms was carried out by the developer for immense monetary profits for residential development. So many lies were told to the public about the condition of the hotel; and we know of course now from the demolition and this move, that the strong heart of pine wood was still strong enough to support the hotel. We hope that the developer will continue to use his giant profits to preserve and renovate this precious piece of historic hotel for future generations to enjoy. Belleair officials and the developer are all responsible for the demolition of this historic hotel for high profit motives. The media continues to INCORRECTLY report that the hotel was torn down because of decay. THIS IS FALSE. The hotel could have been renovated and restored into a magnificent hotel. The town of Belleair FAILED to enforce the 2005 historic preservation ordinance clause "Demolition by Neglect." They just sat back and did nothing to help save the very hotel that helped found their town! Whether it be for an increase in tax dollars for the town of Belleair or to make the developer richer, the hotel was destroyed. We have found four salvage companies that have taken the beautiful historic bricks and heart of pine wood from the Biltmore walls and floors and are reselling them to be made into luxury homes and furniture! So much for the false claim of decay! It was all fabrications to justify tearing down the hotel. So the public was lied to over and over by the developer, Belleair officials and the media. In the photo above, this is all that remains of the beautiful Victorian Belleview Biltmore Hotel 1896 after demolition of its magnificent north and south wings, Carriage Patio Room and Tiffany (glass ceiling) ballroom. Wolfe House and Building Movers out of North Carolina is the company performed the move. Magnificent history was destroyed all for massive profits of building more pricey condos and townhomes around it. Condo owners around the Biltmore were never given the opportunity to be told that future condo towers would be 80 foot tall blocking their view! No one ever told them this new condo project would take ten years to complete! There were only scattered and many times unannounced meetings by the condo leaders; all designed by the condo leaders to demolish the Biltmore by NOT giving truthful information or taking a formal vote. Read on below. This is the original beautiful Belleview Biltmore Hotel in 2015 before massive demolition took place in 2016 all to make massive profits in its destruction. As noted above, the public had been erroneously told repeatedly that the hotel was too old to be saved, and yet every effort has been made by the current owner to salvage its individual bricks and sturdy heart of pine wood, piece by piece, to be resold by salvage companies. These historic pieces would then be incorporated into other buildings or homes and even ball point pens! A far cry from the historic Biltmore. Lies were told repeatedly to the public by a financially-crazed developer, all in the name of making money. The two lawsuits that were filed in order to help save the Belleview Biltmore Hotel have been voluntarily dismissed by the plaintiffs. They were both initially filed in January 2015. The reason for these dismissals is that most of the hotel unfortunately has been demolished. Please note that the Belleview Biltmore WAS saved in 2007 when an investment/realtor company, Legg Mason, purchased the hotel and had grand plans to restore it. 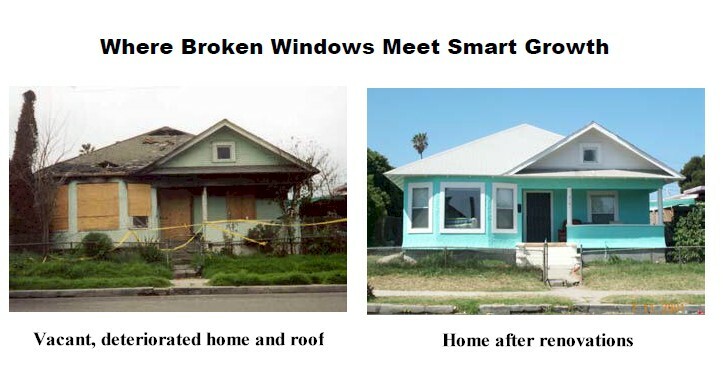 However, due to a number of factors including private Belleair citizens filing lawsuits to protest certain building designs resulting in a delay and then the Great Recession of 2008, the investor lost its mortgage. They sold to a company at a huge loss, whose purpose was to resell it at a huge profit. They never had any plans to restore it. Another developer/architect R.J. Heisenbottle did have a contract on the hotel to restore the hotel, but unfortunately with the recession failed to find investors and lost the contract after six months. After the hotel was closed in 2009, and the contents sold off by the 2007 realtor/investor in 2009, the Town of Belleair never fully enforced their Historic Preservation Ordinance (a LAW) that they passed in 2005, especially the "demolition by neglect" portion. As a result the former owners allowed the hotel to deteriorate in the rain, wind and outdoor elements: Belleair officials just STOOD BY AND DID NOTHING TO STOP THE DETERIORATION except some worthless daily fines that the owner legally maneuvered themselves out of. So the Belleview Biltmore appearance continued to deteriorate making it more difficult for an investor to purchase the hotel, even though the hotel was able to be restored. Therefore the Town of Belleair broke the clause in their law "DEMOLITION BY NEGLECT." They never enforced their own town code like they would have made home owners repair their roofs for example or lawns being cut etc. When the condominium leaders around the Biltmore saw the deterioration, and potential loss of their property value, they started pressuring Mayor Gary Katica to tear the hotel down. Mayor Katica CAVED in as did his other Commissioners to vote to ultimately allow the demolition. The condo leaders failed to properly announce meetings for the condominium residents, and there was NEVER a formal paper vote among condominium owners to see if each and everyone wanted to tear down the hotel! Condominium owners wrote to us at Save the Biltmore complaining that they no one ever told them the new condo towers would be as high as 80 foot tall obstructing precious views! No one ever told them this new condo project would taken ten years to complete! There were only scattered and many times unannounced meetings by the condo leaders; all designed by the condo leaders to demolish the Biltmore by NOT giving truthful information or taking a formal vote. With so much pressure on Mayor Katica from the condo board leaders, he gave in from political pressure, in order to be re-elected which he was in 2015. This led the way for demolition of the Belleview Biltmore. The Belleair Country Club also wanted condominiums built in place of the Biltmore so they could increase their membership which was falling because more people are NOT playing golf and not joining country clubs. By having more condominiums in place of the Biltmore, this would increase the population of wealthier people who could join the Belleair Country Club making it more financially successful. By the way, the current owner Mike Cheezem of JMC Communities is a member of the Belleair Country Club!! What are the chances of Mr. Cheezem saving the measely 10% of the Biltmore anyway? He says a lot of things. For example he promised that he would save part of the wonderful historic Clearwater Beach Hotel, and yet he failed to do so. He has stated that he has respect for the history behind these wonderful structures, and yet he continues to work to tear them down. Mr. Cheezem originally said that even saving a tiny portion of the Biltmore is not even possible but his current comments appear to be just a "bait and switch" for him to continue his demolition. Already walls and a fire escape have fallen through the roof of the historic beautiful Carriage Porch into its interior. 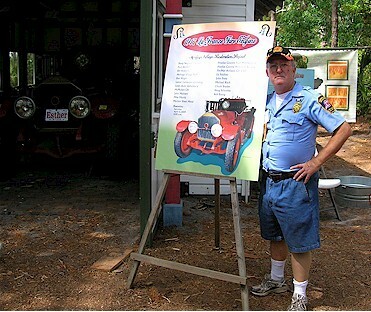 Mr. Cheezem said he would save the Carriage Porch and move it to form part of his boutique hotel. We wonder at this point if saving the broken down Porch is even possible at this point. The disregard for the porch roof shows his disdain for saving parts of the hotel. Now that Mr. Cheezem has the approval of Belleair Commissioners to demolish the Belleview Biltmore, why should he keep his word to save any part of it? It will be just an added expense and time. What would motivate him to do so? The small historic 1897 portion as noted above is scheduled to be moved on December 19 and 20, 2016. We certainly hope this is accomplished successfully! "That small wing will not survive a rotation and a relocation. It will most likely collapse and eventually a small replica of a building will be built and after a few years of losing money it will be converted into a clubhouse for the condos. I don't see a five story building rotation and 550 ft moving working." 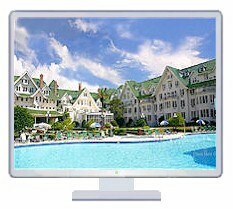 A TV segment on local NBC news showed photos taken by a drone of the current "state" of the semi demolished Biltmore. The woman representing JMC Communities and Mike Cheezem made some most insulting and arrogant comments about what the original builder of the hotel, Henry Plant, might have said with the new development. 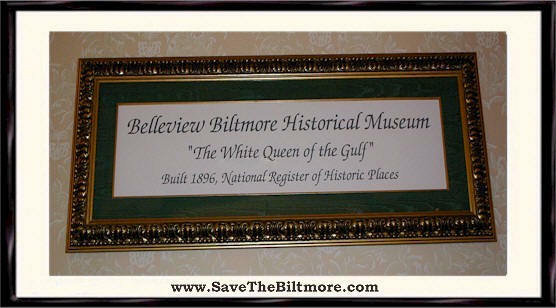 We will not quote her, however, our view is that Mr. Plant would be horrified at the MUTILATION done by these financially-crazed developers to the historic and beautiful 1897 Belleview Biltmore Hotel, the White Queen of the Gulf. So please connect the dots as to the politics and financial gains that will occur now that most of the Belleview Biltmore is destroyed. From the Tampa Bay Times August 18, 2016 article: "Cheezem said he is preserving a 38,000 square-foot section of the hotel including the lobby, where rail passengers disembarked on one side and carriage passengers on the other. Renamed the Belleview Inn, it will be moved to "the terminus of a new boulevard where we are 90 percent complete putting in date palms and flowering bushes,'' he said. "It gives you that Old Florida feeling as you drive up.'' 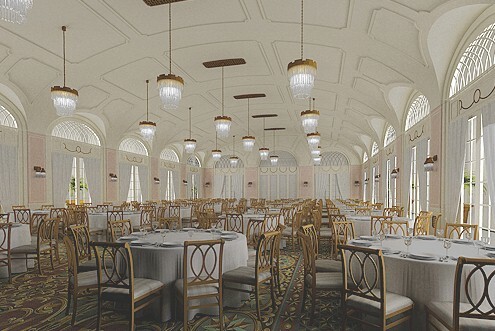 The inn will have an ice cream parlor, a "Tiffany Room'' incorporating some of the hotel's original Tiffany stained glass and a history room telling the stories of Plant and his hotel. It will also include what Cheezem calls a "small, beautiful venue'' that can accommodate up to 75 guests for weddings and other functions. That inn will really become the social center for the Belleview Place community and for a lot of homes in the area,'' Cheezem said, noting that there are several hundreds houses nearby. Like the Biltmore, the inn and surrounding residences will have white exterior walls and green gable roofs." "JMC is preserving roughly 10 percent of the hotel — the original lobby and three floors of rooms above. It will be remodeled into a 33-room boutique inn with an ice cream parlor, a bar, room for weddings and functions, and displays of photos and memorabilia. Like the Biltmore, the inn and surrounding condos will have white exterior walls and green gable roofs. Even saving that much is tricky. It involves raising a four-story structure up on jacks, rotating it, hauling it the length of a football field, and plopping it back down on a new foundation. That job alone will take weeks. "It's expensive to move it, but we felt it was critical," Cheezem said. "With the photographs and artifacts, you'll get a great sense of what the resort was like when it was functioning. That will be worthwhile." Belleair town officials, the condo leaders, the Belleair Country Club, Mr. Cheezem and Pinellas County Commissioners all played a deliberate role and colluded in the destruction of this beautiful historic 1897 Victorian hotel...all for high profits. This is the future appearance of the small portion remaining of the original 1897 Belleview Biltmore Hotel, to be called Belleview Place. The image is taken from the JMC Communities web site for the new inn. lleview_biltmore_r.html Video of the historic portion which was moved 320 feet on December 21, 2016.
http://wfla.com/2016/12/21/portion-of-famous-belleview-biltmore-hotel-to-be-moved/ Video of the morning of the move. Biltmore Update MEETING RESULTS Thursday, December 11, 2014 Be sure to read down to the lawsuit information! Unfortunately both the Historic Preservation Board and the Belleair Mayor and Commissioners voted YES to unanimously approve the SCOA, thus paving the way for the demolition of 95% of the Belleview Biltmore Hotel most likely in March, 2015. So corruption, collusion and breaking of Belleair town laws prevailed among the rich and powerful members of the Belleair County Club, of which the developer Mike Cheezem of JMC Communities is a member of as well as his and the hotel's owner KAWA, attorney Ed Armstrong and Belleair politicians and appointed Historic Preservation Board members. Also please note that Belleair Commissioners Kevin Picaretto and Steven Fowler are BOTH members of the Belleair Country Club, of which Mike Cheezem the developer is also, and that Belleair Commissioner Tom Shelly and Historic Preservation Board head member David Hutcheson ARE realtors. The last two could make a small fortune selling Cheezem's condos to the public. Where in the world would these four people have any motivation to REALLY save the Biltmore anyway in the end!? I often wonder whether the members of the Historic Preservation Board ever spent any time like we did and others to find investors to purchase the Biltmore, since KAWA hired a worthless realtor to do so once Legg Mason gave up after the recession hit?? On a positive note, we certainly appreciate all the support from you our precious, devoted Biltmore followers whether it be email or postings or coming to meetings throughout the past years. And thank you for the thank you letters for our persistence in trying to Save the Biltmore for ten years! They are very uplifting to me and our other two directors, Carol Kuzmiak, V.P. and Doug Mann, Secy/Treas. And remember that the Biltmore was saved in 2007, but many factors including lawsuits filed by Belleair residents (of all people!) the Great Recession contributed it to being on the market again. One of the reasons the officials gave for their ignorant vote is that 10% will be saved. A MEASLY 10%! This hardly justifies near total demolition! 90% will be destroyed including the beautiful Tiffany ballroom among many other historic rooms etc. So this measely 5% was saved only to possibly collapse, but enough for votes to go through for demolition! Pretty sneaky ploy by Mike Cheezem who will now buy the Biltmore. Well if all this proves to be true, then Belleair officials have been duped royally by JMC Communities and Mike Cheezem and Ed Armstrong! I hope that you send emails to the following people, Historic Preservation Board, care of the town manager, Mayor Katica, Belleair Commissioners, Pinellas County Commissioners who have participated to demolish the Biltmore showing your protests, your opinions and obviously your ANGER! Included in this list is also Mike Cheezem of JMC Communities, the ultimate historic hotel destroyer who contributed to breaking laws in Belleair. Some people in Belleair might be filing a lawsuit to stop the demolition, and we would be offering to help fund it through you our precious Biltmore supporters. I have received emails from many supporters saying we need to sue Belleair for breaking their laws. Politicians who break our precious laws MUST BE SUED! We as Americans have to take a stand against corruption and how these politicians want to destroy the White Queen of the Gulf's future! The 2005 Preservation Ordinance was broken, with "demolition by neglect" and also failure to follow Belleair's Comprehensive Plan to preserve the Biltmore and failure to uphold the CLG agreement of 2014. So laws were broken; unfortunately in our crazy and outdated legal system, it costs money to get justice when it comes to political issues. No wonder why politicians are distrusted so much in our country. It all starts at the local level. But more on the lawsuit later. FINAL THOUGHTS: The lesson learned from the past ten-year fight is to encourage your children and grandchildren to develop an interest in historic preservation. Take them to historical museums, historic hotels, historic homes, historic locations and so forth. Create loving memories with them of the present with the past. It will build a powerful interest to save historical buildings in the future. 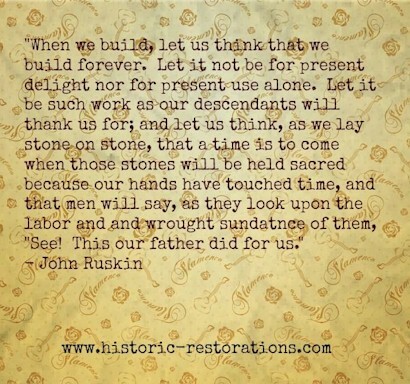 Remember that some of the children of today will become politicians and developers in the future, and we must entrust in them the love of historic preservation so more historic buildings will be saved in the world. In Belleair, officials, whether elected or appointed, just never felt enough love for historic preservation; if they did, they would have passed a historic preservation ordinance long ago in 2004 and 2005 to save the Biltmore. But they failed on this terribly when the Biltmore was first faced with demolition. Shame on them! As I wrote in my last Biltmore Update, EDUCATION, EDUCATION, EDUCATION is the key for saving historic buildings and locations and artifacts by developing and teaching a love for it early on with our children and grandchildren. So to end on a positive note, remember that a successful lawsuit can still save the Biltmore. And get going, make a plan for 2015 to instill the love of historic preservation in everyone! Note: I often send out information to Facebook BEFORE sending out Updates. So if you wish to receive the latest on the Biltmore, sign up for Facebook. You do not have to post any personal information, just sign up. There are opportunities in daily life for each of us to determine what legacy we leave behind. Some of these opportunities are small. Other times, the actions we take are quite visible and impact the lives of many others for decades to come. In those moments, we are not unlike a soldier who is tested in battle. Each individual, like each soldier, must make choices whenever confronted with opposition – to run and hide or to advance – to do everything within one’s power to save that which they have been entrusted to protect, no matter how strong the opposition. The fate of the Belleview Biltmore Hotel is currently in the hands of a few people who must decide not only whether the hotel will be saved or demolished, but also what legacy they, as individuals, will leave behind. Will they run and hide or will they stand against strong opposition? Members of the Historic Preservation Board and the Town Commission in Belleair are like soldiers right now. Each member must decide if they will stand and protect the Belleview Biltmore Hotel against strong opposition or whether they will cower. Each member has one vote and that vote will become their legacy. We honor the legacy of soldiers who go into battle against strong opposition and yet somehow find it within themselves to do the right thing – to advance in order to save that which they have been entrusted to protect. Likewise, we need to honor those on the Historic Preservation Board, as well as the Belleair Town Commission, who continue to fight against strong opposition to save the Belleview Biltmore Hotel, a duty with which they have been entrusted by both mission and law. We also need to make sure that those who act cowardly and who do not uphold the mission with which they have been tasked are known by name forevermore. It is important that their names be etched into the annals of the Belleview Biltmore Hotel’s history, either as its saviors or destructors. The names of these people must be irrevocably connected to the hotel’s fate and remembered as a part of their legacy. Hopefully they will choose to make their grandchildren and great-grandchildren proud that they stood up against wealthy opposition and saved this incredible structure for the entire world to continue to enjoy. But if they cave to pressure and possibly selfish motivations, this too must become a part of their legacy. Either way, their names should never be forgotten. The Historic Preservation Board and the Town Commission of Belleair have the opportunity to save the Belleview Biltmore Hotel – the most precious and historically significant building in upper Pinellas County. They have the law on their side. Just five years ago, an investment group was prevented from restoring the Belleview Biltmore Hotel to its former glory when the real estate economy and banking and investment industries tanked. Now the economy is rebounding and investors are back. One investor, the opposition, wants to demolish the hotel and replace it with condos and townhomes. Two groups of investors possess the skill, desire and necessary financial backing to purchase and restore the Belleview Biltmore to its former glory. There is absolutely no reason for members of the Historic Preservation Board or the Belleair Town Commission to vote against the very missions of the Boards on which they serve. Therefore, the names of the people who serve on these Boards must be tied to the Belleview Biltmore Hotel forever – either as it saviors or as its destroyers. The legacy of these individuals must be remembered. Whether they earn a legacy of honor or disgrace, that legacy must follow them forever. Therefore, going forward, all of us need to post their names, along with their votes, prominently on the Internet. Did they choose to run and hide, or did they advance – to do everything within their power to save that which they have been entrusted to protect, no matter how strong the opposition? If these individuals do not have the backbone to stand up and do the right thing, then their ancestors must know the true foundation of their character is cowardice. On the other hand, if these individuals stand together to save the iconic Belleview Biltmore Hotel, that too, should be widely acknowledged with a legacy of gratitude and respect. But whatever actions these individuals take, or fail to take, they must never be forgotten. Once the voting is finished on December 9, 2014, we will post these names, along with each of their votes. We will then ask you to repost this information throughout the Internet, so that their legacy will follow them forever. Please note date change from the last post. The date of the meeting will be Tuesday, December 9, 2014 at 4 p.m. The Belleair Town Commission meeting will be held afterwards to vote on the SCOA at 5:30 p.m. Historic Preservation Board: Kathy Gaston, David Hutcheson, Alex Chamberlain, Peter Marich, Nancy Reardon, Donald White, Cliff Zurkan and Commission Advisor: Kevin Piccarreto. Belleair Town Commission: Mayor Gary H. Katica, Deputy Mayor Stephen Fowler, Commissioner Tom Shelly, Commissioner Kevin Piccarreto, Commissioner Michael Wilkinson. In the meantime, please remember that, like these individuals, we each have our own legacy to forge. Will your legacy show that you gave up and stood idly by while the hotel was destroyed or that you stood against strong opposition and continued to fight to do everything in your power to make sure it was saved? Your voice matters. A chorus is harder to ignore than an individual. The opposition knows this and they are spending a lot of money to raise a choir. We need to make sure they know we will continue to fight and that we will always remember what actions these people took or did not take. Remember, Town Hall Meeting December 9, 2014 4 p.m. Commission meeting after this. What this means, is that the RM-10 zoning issue has passed and the zoning will be changed. Please note that the Mayor and the three commissioners who voted yes purposely broke Belleair law: their Comprehensive Plan which states that any zoning created MUST be consistent with their Comprehensive Plan. The new zoning is NOT consistent with Belleair's Comprehensive Plan and would allow for condos to be built if the hotel were demolished. However the Comprehensive Plan specifically provides for the saving of the Belleview Biltmore Hotel! So the vote tonight most likely will be tested in court in the future and proven to be illegal. The great news is that Belleview Biltmore Partners still wish to purchase the hotel, and they assure us they will continue to pursue efforts to buy it. We have an EXCITING press release from Bay Proby who represents Belleview Biltmore Partners, the firm who has been trying to purchase and renovate the Belleview Biltmore Hotel. For everyone who said it could not be done for BBP to raise the money to buy the hotel, THEY HAVE DONE IT! They showed the proof of their funding to Belleair town officials in a private meeting on April 1, 2014 by showing the paperwork to them. A RESTORED BELLEVIEW BILTMORE HOTEL, THAT is a VISION FOR BELLEAR! That has community pride! This photo shows the seven ugly condos that surround the love Belleview Biltmore Hotel. Belleair officials need to IMMEDIATELY stop any zoning changes that would allow the demolishment of the Belleview Biltmore Hotel and replace it by more condo development! And developer Mike Cheezem, who has a six month contract to purchase the Biltmore and demolish it, calls his condos a "vision" he wants for Belleair after demolishing the Biltmore! Belleair officials need to encourage Mike Cheezem to sell the hotel to Belleview Biltmore Partners who have the money now to purchase the Biltmore so that their HISTORIC hotel can be saved! Cheezem says however he wants to continue his "vision." Vision? What vision? Condo development is a vision? Who is he kidding! Since when!? Will history remember condos? Are the seven condos already around the Biltmore a vision? Does Belleair ever brag about those? NEVER! Belleair hangs photos of their beloved Belleview Biltmore Hotel in their town hall meeting room. Will they replace it with Cheezem's condos! Hardly! They do not even have photos of the seven condos in their town hall meeting room! Has ANYONE ever seen a history book honoring the memory of demolished condos! A restored Belleview Biltmore Hotel by Belleview Biltmore Partners is real VISION! That has community pride! NOT more condos! 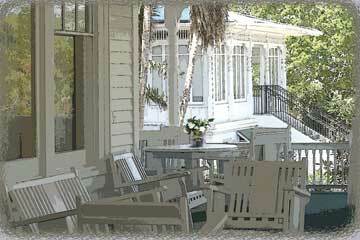 The Belleview Biltmore Hotel can be restored just like this home! 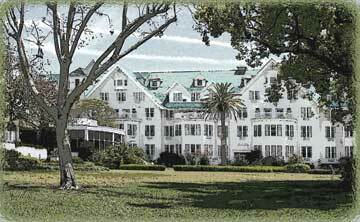 PRESS RELEASE Monday, January 20, 2014--The hotel can still be saved and restored by Belleview Biltmore Partners! NEW HOTEL CONTRACT JANUARY 2014!! 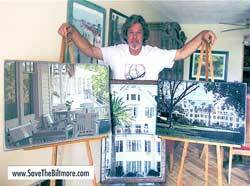 Unfortunately there is a contract out by JMC Communities Mike Cheezem, CEO, to purchase the Biltmore. JMC Communities wants to demolish the wonderful White Queen of the Gulf and build ugly townhomes/condos! The contract is set for six months at which time they must buy the hotel or back out. Obviously they can decide NOT to purchase the hotel themselves OR our BILTMORE SUPPORTERS can convince them via emails, letters and phone calls that these developers MUST back out from the contract thus SAVING THE BILTMORE! So it is IMPERATIVE all supporters who live in this area to write JMC you want the hotel saved, sell their contract to Belleview Biltmore Partners who now has the money to buy the hotel! Let JMC and Cheezem know that you will NOT tolerate demolition of the Biltmore and that you only want it saved. Back in 2005, hundreds of supporters stormed the Belleair town meeting hall and their enthusiasm for saving the Biltmore resulted in the developers (DeBartolo) backing down and out! We MUST do this again with all of your help! 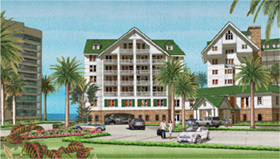 By the way, JMC Communities is the group that DEMOLISHED the beautiful Clearwater Beach Hotel! So for everyone who loved that hotel as much as I did, JMC fails to see the value in historical or old hotels like you and me which are treasures to the community. No matter what article you have read recently, even though the hotel is under contract, the hotel STILL can be saved, so be there this Tuesday! Motivate this townhouse/condo developer to give up! NOTE: We now have two different ONE MINUTE EMAIL CAMPAIGNS, one to the JMC Communities who want to destroy the Biltmore and one to Belleair officials. 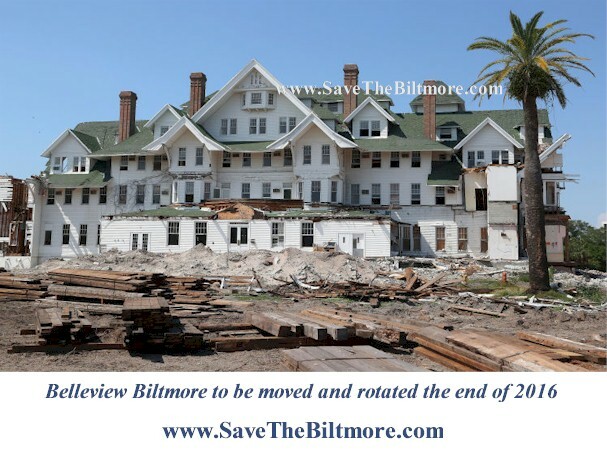 As a supporter of the Belleview Biltmore Hotel, it is in the best interest of the community for you to withdraw from purchasing the hotel from KAWA. Your condos and townhomes condominiums would deface Belleair's beauty turning that area into "Belleair's Concrete Condo Canyon" plus also defacing Pinellas County's history. You destroyed the lovely Clearwater Beach Hotel whose citizens in the surrounding neighbors and tourists loved going there. And now you want to destroy the Biltmore in Pinellas County where thousands of people have dined, married or stayed there who want it preserved. The hotel still can be restored no matter what you believe or say. The citizens of Belleair and Pinellas need this historical landmark. 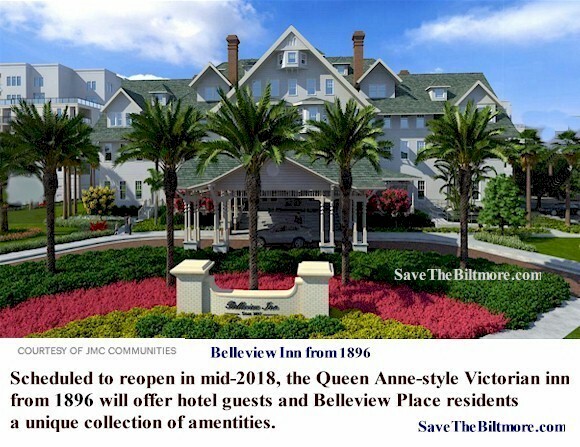 Belleair's Comprehensive Plan includes saving the Belleview Biltmore Hotel, and yet you dare attempt destroy one of their beloved landmarks and history. SHAMEFUL. The people who love the hotel need you to back down from purchasing the Biltmore. Right now your only legacy you will leave is destruction of a Pinellas landmark hotel. Is this what you wish for your legacy, destruction? 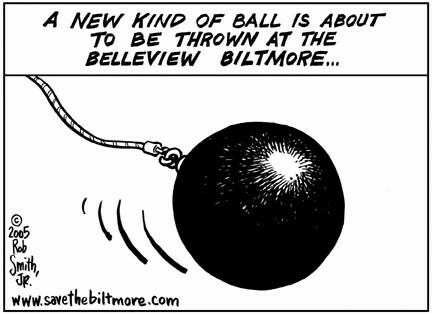 Listen to what the society around you has been saying for the past nine years, spare the Belleview Biltmore. If you participate in its destruction, you will participate in the willful destruction of your own heritage as well as that of the world around you. SECOND ONE MINUTE EMAIL CAMPAIGN TO BELLEAIR OFFICIALS: We urge EVERYONE around town and the world to write Belleair officials an email encouraging them to deny zoning changes and to continue to save the Biltmore as a hotel. So even if you plan on attending the January 21 meeting, PLEASE send an email to Belleair officials. Feel free to write your own thoughts or you may copy this email below and send it to them. It will only take one minute! WE NEED YOUR SUPPORT! Simply copy and paste the eaddresses below to your email program and then either write your own email or copy and paste the enclosed email and SEND IMMEDIATELY! Citizens both locally and around the world have placed their trust in you to follow through with and enforce your own Comprehensive Plan and 2005 historic preservation ordinance that was designed to save The White Queen of the Gulf now and forever. The goal of the preservation ordinance was to protect this iconic structure against "demolition by neglect." The current owners have totally ignored your laws and purposely failed to provide tarps to cover the Biltmore roof in storms and were able to wipe out fines accrued by them through legal maneuvers. As a result, they have taken advantage of you and your citizens. They have insulted your laws and integrity. They are destroying your history and heritage. You now have the opportunity to finally STAND UP to these developers who sought to destroy your history and hotel ON PURPOSE! I urge you to save your historic Victorian Belleview Biltmore Hotel for my generation and future generations to enjoy. I urge you to vote "NO" on any zoning changes January 21, 2013 that would allow for residential development in place of the Biltmore. Take back what is rightfully yours. Then and ONLY then will you will then be in charge of your own town and the Biltmore. It is time to make sure JMC Communities backs off from their contract with your support against them and your support FOR the Biltmore. If anyone reading this web site is interested in becoming an investor with Belleview Biltmore Partners or to purchase the hotel by themselves so that the Biltmore may be saved, PLEASE CONTACT US IMMEDIATELY! Diane Hein, President of Save the Biltmore Preservationists at Email us. Or contact realtors and investors in your area and let them know that the Biltmore immediately needs investors in order to be saved! The Pelican or Belleview Biltmore golf course has been purchased for $13.5 million by the town of Belleair to make sure it will not be redeveloped residentially. 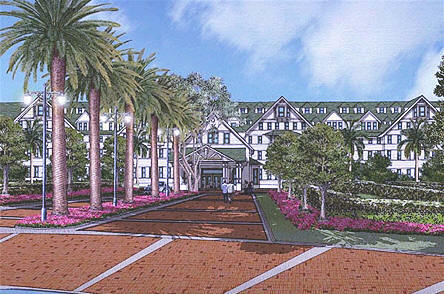 Belleair officials need to assure that THEIR Belleview Biltmore hotel remains a hotel and not a pile of rubble! 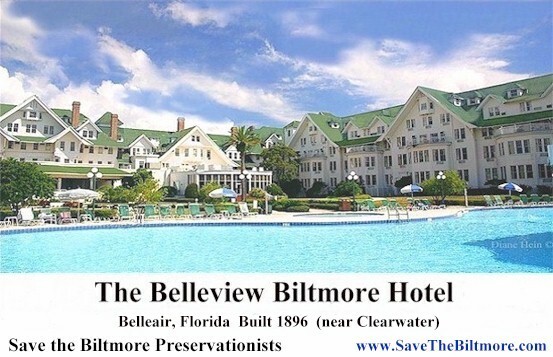 SAVE THE BILTMORE UPDATES: If you recently saw a color ad in the Tampa Bay Times and would like to know more about what all the DETAILS about what is going on in Belleair, click this link and read the first top FOUR Updates. OUR FULL PAGE COLOR ADVERTISEMENT TO SAVE THE BILTMORE: Through the wonderful and most generous support of a few Biltmore supporters, they donated to our nonprofit organization Save the Biltmore Preservationists the funds to place a FULL PAGE color display advertisement, 11 inches by 21 inches, in the A section of the Tampa Bay Times! Their Sunday readership is over 900,000 people! This advertisement to Save the Biltmore will help us, and the Biltmore in so many many ways. We certainly thank them for their most generous donation and for their time in designing the ad. Please do NOT write me on this, either for price of ad or their names. Everything is ANONYMOUS per their request which of course we will honor. Spend your time INSTEAD writing Belleair officials, Pinellas County officials or JMC Communities and Mike Cheezem as mentioned below! To view our color ad click here: http://savethebiltmore.com/AdvertisementJanuary21-2014.htm and then click on the link to the PDF file. Send this link to everyone you know! COMMISSIONER KEVIN PICCARETTO AND THE BELLEAIR COUNTRY CLUB: Commissioner Piccaretto unfortunately has not cared recently whether the Biltmore is saved or not! We just learned that Commissioner Piccaretto is a member of the Belleair Country Club! And remember that the Belleair Country Club wants the Biltmore demolished because it will be able to purchase two more acres to increase their parking lot and thus make more money with memberships! So Commissioner Piccaretto will be voting tonight, and you need to ask him to vote NO to the RM-10 zoning changes because of this EXTREME CONFLICT OF INTEREST!!! BELLEAIR COUNTRY CLUB AND MIKE CHEEZEM: We also have just heard some more shocking information and perhaps not so shocking information! As in my Sunday Biltmore Update, I discussed that the Belleview Biltmore Hotel was under a six month contract to be sold to JMC Communities. We just have heard through someone in Belleair in fact that the CEO, Mike Cheezem, of JMC Communities is a MEMBER of the Belleair Country Club! The Belleair Country Club benefits by the demolition of the Biltmore hotel because they will get two more acres to their property thus enabling them to have more parking spaces and tennis space and recruit more members at a $5,000 initiation fee plus monthly fees. THIS IS AN OUTRAGE! People should start demanding that this developer step down from his trying to destroy our White Queen! Will Mike Cheezem get a special parking spot right in front of the Country Club if the hotel is demolished!? Perhaps! Perhaps he will receive a special plaque in the CC restaurant in his honor for destroying the hotel and making the CC richer? Perhaps! Or how a few free steak dinners? No wait, I know, lifetime free happy hours! I want everyone to start bombarding JMC Communities and Mike Cheezem with EMAILS ACROSS THE COUNTRY telling him he is NOT wanted in Belleair and take his ugly condo development elsewhere. We must stop this man and this company from destroying Belleair and Pinellas County history and the Biltmore! Belleview Biltmore Partners was actually at the Biltmore Monday, January 20, examining the hotel in fact even though there is a contract by someone else! Richard Heisenbottle, architect and lead partner for BBP, said the hotel STILL can be restored and renovated given the opportunity to purchase it. It is NOT anywhere near demolition at all he told us Monday! This is EXTREMELY IMPORTANT FOR EVERYONE TO KNOW THIS AND PLEASE IF YOU SPEAK AT THE MEETING TONIGHT MENTION THAT THE HOTEL STILL CAN STILL BE RESTORED! We know the some of the media and KAWA and Mike Cheezem are giving FALSE information about the condition of the hotel and whether it can be restored or not! KAWA and Cheezem would make millions with the Biltmore not saved, why should they tell the truth! 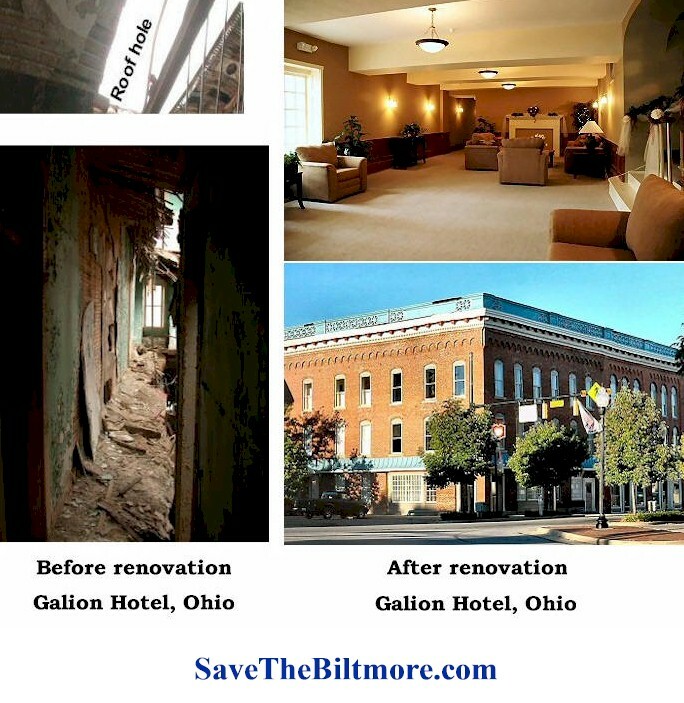 There is still TIME TO RESTORE THE BEAUTIFUL BELLEVIEW BILTMORE HOTEL! We hope all the media investigates this information further that Mike Cheezem is a member of the Belleair Country Club who wants the Biltmore demolished and reports it! My concern frankly with some of the media is that they may benefit with the hotel demolished. That is, if the hotel is not saved and Cheezem should buy it and build his ugly condos/townhomes, Cheezem could use the media to spend thousands of dollars for advertisements for his real estate endeavors like what he wants to do in Belleair! So let's see, Mike Cheezem and his JMC is tied in with Belleair's Country Club, donating to politicians like Pinellas County Commissioner Karen Seel and John Morroni who supposedly endorse saving the hotel and potentially the media!! Nothing new about money, media, politics and country clubs is there!? So you can understand why so many historic buildings get demolished! We need community support to drive Cheezem out like you successfully did with DeBartolo in 2005! 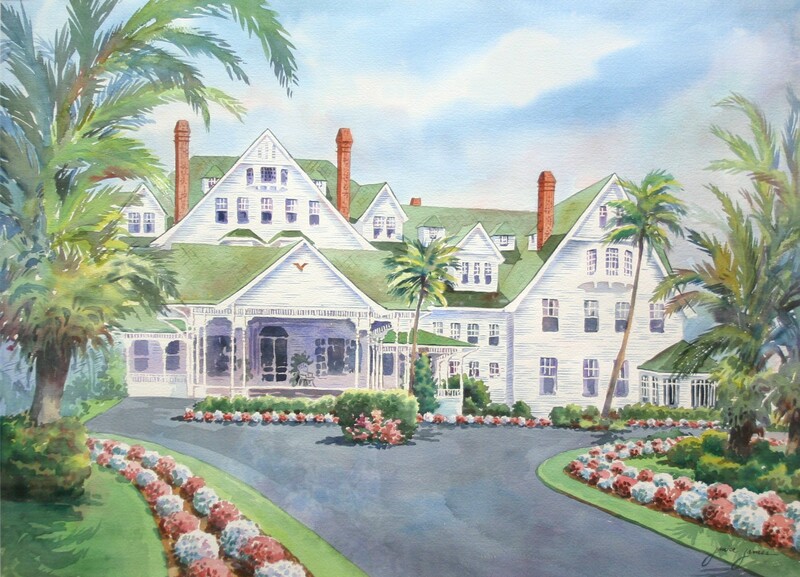 And now we also learn that Commissioner Kevin Piccaretto is also a member of the Belleair Country Club, which will benefit with the demolition of the beautiful Belleview Biltmore Hotel! We all remember the American Revolution where the community and farmers successfully fought off the English aristocracy. It's about time the communities get together and do the same with JMC! And given all the negative comments Mayor Katica has given about the hotel, should he be banned from voting? Thank you to everyone who wrote Belleair officials or attended the Tuesday, September 4, 2012 meeting. Great news!! There were three out of five "YES!" votes for the second and final reading of the tax abatement so it was approved! Each vote counts equally. Only three votes out of five votes were needed. Note that Mayor Katica and Commissioner Piccarreto do not support saving the hotel! A big thank you to Belleair resident, Karmen Hayes, for doing recent TV interviews to save the Biltmore! Karmen Hayes honorary member of Save the Biltmore Preservationists and her husband of 22 years TC Hayes are on this video. TC Hayes is interviewed on this video. Renovation plans projected for completion 2015 by Richard Heisenbottle, Architect. A concept design depicts what will be the new entryway of the Belleview Biltmore. To the right a reflecting pool with cabanas. We hope you become one of our nonprofit members. We offer Copper, Bronze, Silver, Gold and Platinum memberships with certificates and a variety of gifts with each level. See Memberships for more information. Also have fun shopping at our Biltmore Online Gift Shop. You will help the Biltmore stand tall for another 110 years! Order a Biltmore calendar and proudly display it at home or at your workplace. Wear a Biltmore T-shirt, carry a Biltmore tote bag, a Biltmore charm or display a Biltmore license plate on your car. All these will stir interest with the people around you and help us promote the Biltmore! 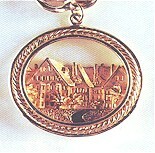 An honorary one-year membership will be given to anyone purchasing any of our special Biltmore jewelry! http://savethebiltmore.com/BelleviewBiltmoreNewspapersAndPublications.htm (please note due to the death of our vice president and my husband, many recent newspaper articles have NOT been posted for a few months) In due time, they will be posted. The most current article has been posted however. 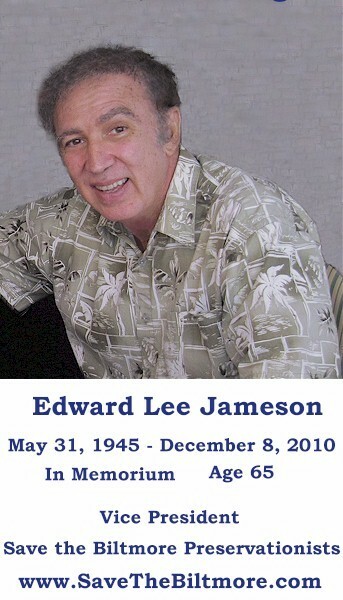 In Memoriam: Our Vice President of Save the Biltmore Preservationists Ed Lee Jameson, and husband of our president of our nonprofit organization, Diane Hein. He was loved and will be truly missed in many, many ways. http://clearwatergazette.com/20110120/A4_gif.html Link will only work if you "cut and paste" it! benign brain tumor for several months before his death. The death was announced by Jameson's wife and partner of 34 years, Diane Hein, with whom he co-founded Save the Biltmore Preservationists. Says Hein, "Ed was a fascinating, articulate, analytical and loving man who contributed so much to historic preservation in Pinellas County." within Pinellas County and indeed contributed much to the county's very development. "He always had faith that the people of Pinellas County, Belleair and their elected officials would do their best to preserve the hotel." A military veteran, Jameson served proudly in the United States Air Force in Great Britain as a weather researcher. Once discharged, he attained a Bachelor of Science in Business from Eckerd College and went on to form a career in information technology, retiring as a systems analyst from Pinellas County Government. A memorial service was held at Bay Pines Veterans cemetery for Jameson who is survived by wife Diane, brother George (Faith) and two nephews. Side note: Ed colorfully once told this about the Biltmore to Harlan Weikle reporter for the Belleair Bee: "The attic area was akin to the bowels of a ship at sea, the crew's living quarters, only turned upside down." Ed used to walk the long two miles of corridor at the Biltmore during his lunch hours when he worked downtown before he retired. He loved the hotel beyond words. We strongly feel one reason that the Biltmore is still standing is because of Ed, who introduced the hotel to me his wife, Diane Hein, President of Save the Biltmore Preservationists who put up this web site in 2004. With the help of much community support who contacted this web site when the St. Petersburg Times mentioned it, the Biltmore was saved from demolition back in 2007. There were HUNDREDS of people involved in the saving of the Biltmore at that time, and we are truly grateful for all their help. We give a big thank you to Dell Valentine Kelleher, Clearwater, Florida for donating her grandmother's chest of drawers and mirror which were in the Belleview Biltmore Hotel from around the 1920's to the 1930's to our nonprofit organization Save the Biltmore Preservationists. This hickory wood furniture was unfortunately removed from the hotel right before it was used to station World War II military personnel. However we are extremely grateful she wrote and donated this wonderful piece of Biltmore history to us. Here is a photo of it with more information on it below the picture. Here is the history behind the furniture. In the 19th century Bill Richard made and sold hickory chairs in the Town Square in Martinsville, Indiana. "Old Hickory" furniture (honoring President Jackson) came into being in a church in 1892. In 1898, a full line of furniture products was shipped to homes and resorts. There were multiple makers/owners of "Old Hickory" over time. Early Arts & Crafts mission furniture makers may have received many of their concepts while visiting the Martinsville "Old Hickory" production. The earlier woods used were hickory while later woods were oak, chestnut and pine. One of the most popular variations is rustic log style. Many homes, resorts and national park lodges use both old and new variations of "Old Hickory" furniture. A few owners of "Old Hickory" include Old Faithful Inn, Grove Park Inn, Camp David, the Disney Rainforest Cafe, and celebrities Dolly Parton, Robert Redford, Barbra Streisand, and Oprah Winfrey. 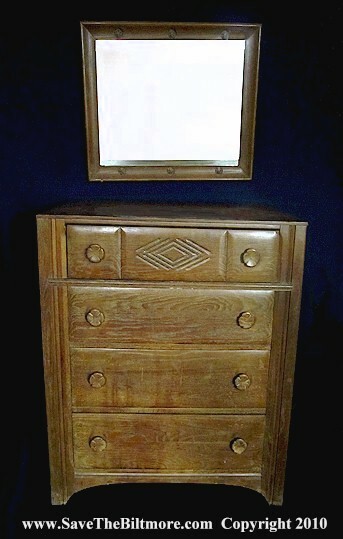 The Belleview Biltmore hickory chest of drawers has an early mark (later variations had bronze and paper tags) and is an example of historic Mission/Arts and Crafts style furniture. Hickory is the heaviest and hardest of all American hardwoods, and it was used by the American Arts and Crafts movement, Amish furniture makers, pioneer wagon wheels and on the Wright brothers’ Flying Machine. The vintage furniture is a heavy, well built, solid wood, utilitarian chest of drawers with hand cut half-blind dovetails and solid glue joints. The finish is worn, with some small chips and various board-to-board glued edges have separated. The chest and mirror could be restored, but then it would lose the wear and tear history of life at the Biltmore. A woodworker experienced with hickory wood could duplicate this basic design. Our vintage Biltmore chest has four drawers with carved, hickory nut knobs and the 31" x 25" mirror has horizontal sections (rails) with hickory nut incised carvings. The frame (carcass) has horizontal and vertical routed moldings, 43" vertical sections (stiles), 38" horizontal sections (rails) and is 20" in depth. The top-drawer front has opposing "rustic" style V shaped routings cut into the front face and measures 30x18x7". The next drawer measures 30x18x8" and the two bottom drawers measure 30x18x9". The piece is signed "Old Hickory, Martinsville, Ind. Dusty Acorn." The date is unknown but could be in the 1920's or 1930's but is before World War II. The entire package measures 20x38x43" and weighs approximately 150 pounds. Some early records of the first "Old Hickory" furniture were unfortunately destroyed when the original furniture company burned down. The chest and mirror are currently being kept in safe storage for future Biltmore preservation efforts. Here is information from Ms. Kelleher: "My grandmother Dell Valentine was a very connected (socialite) here in Clearwater. I am a fourth generation Clearwater native. One of her very dear friends was Billy Burke a golf pro, and I think he played with Babe Ruth on the Resort course at times. Also she was a great friend of Jim Smith who was another golf pro in the area at the time. Plus she was on the board of or one of the founders of every committee they had going back then. I really don't know how she ended up with the furniture but it was in the back bedroom of her house for as long as I can remember as a child . She had the set of twin beds and the dresser/mirror and maybe night stand but I happened to salvage the dresser when I needed one when I moved out of my parents' house. My grandfather Wilson "Rudy" Valentine was the founder and president of First Federal Savings and Loan downtown. My great -grandfather George Eichelburger was a builder, and he built some of the homes down in Harbor Oaks near the hospital. My grandmother graduated from Clearwater High School in the first graduating class on '38, Mom graduated in '58 and I in '78. 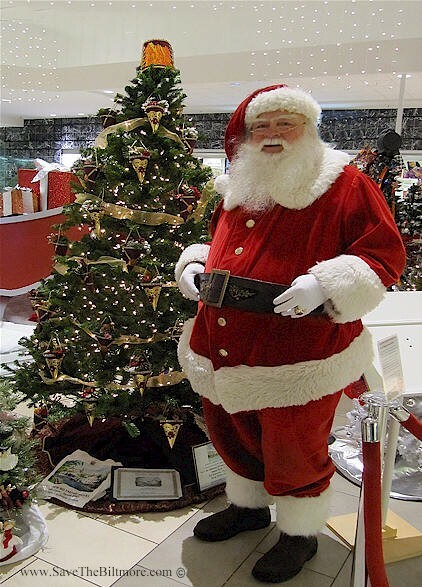 To view our Christmas tree from 2008 which won a red ribbon and our 2009 Christmas tree click this link. FREE Desktop Wallpapers, just click on the photo, and it will take only seconds to download them to your screen! If you work at a computer, downloading these images will be a great opportunity to talk about the Belleview Biltmore Hotel. The web site name www.SaveTheBiltmore.com is on each large photo and your co-workers can come to our web site for information or wallpapers or sign up to be on our mailing list. If you want to help us promote the Biltmore, this is a great way for you to do this, and it's FREE! If you have any old/historic photos of the Biltmore and/or of your family at the hotel, please send them to us and we will post them. We are especially looking for photos of the interior of the hotel before World War II before all the furniture was removed when the Biltmore housed the military. http://www.youtube.com/watch?v=5uvcIzpprp0 to read the YouTube video trailer for Bonnie Sue Brandvik's new book "Pearls, Spirits of the Belleview Biltmore." Ms Brandvik's novel takes us from modern day turbulence into the looking glass - a century's past of beauty and elegance and the strong women whose survival often depended upon their ability to band together with other women in a male dominated era. Blending the stream of time effortlessly, Brandvik gives the reader a chance to reconsider a world of possible futures, providing an enlightened learning experience derived from the heritage of our forebears. “When finally something happens with the Biltmore, it looks like it’s completely gone and whatever’s going to be there isn’t going be anything like what was there,” Luisi said. Diane Hein, who heads the Save the Biltmore Preservationists in Belleair, said such a compromise would be unthinkable for the old resort nicknamed the White Queen of the Gulf, which is listed on the National Register of Historic Places. “That is not historic preservation, that is Disney World fantasy and I would not support it,” she wrote in an email. Is the Biltmore in its Final Days? Heisenbottle said Belleview Biltmore Partners is working to “negotiate the terms of the sale with the hotel’s owner,” but did not go into any details. “We urge supporters to again spread the word to anyone they know that the Belleview Biltmore needs investors to help purchase the hotel,” the release said. Visit www.savethebiltmore.com. BELLEAIR — Three months after the owner of the historic Belleview Biltmore filed a request to raze most of the 115-year-old hotel, Richard Heisenbottle, a Coral Gables architect who wants to restore it to its former grandeur, announced Monday he has a contract to buy it. "It's very exciting and beyond wonderful that the hotel is going to be restored again," said Diane Hein of Save the Biltmore Preservationists Inc.
A national nonprofit and other preservationists vow to fight the owners' proposal to raze the hotel. BELLEAIR - Five days after the owners of the Belleview Biltmore filed a request to raze most of the 115-year-old hotel, a national nonprofit is urging town leaders to deny that request. Approximately 175 people turned out at this meeting, nearly all in support of saving the hotel. Local preservationists say they're gearing up for battle. They're booking TV interviews, passing out fliers and coming up with a game plan to combat rhetoric from the owners. Diane Hein, the head of a preservation group, said they're trying to get residents to come out to Tuesday's city meeting, where the Biltmore will be discussed. "We're trying to show the commissioners that people still want the hotel saved and it's very important that the historic preservation ordinance be upheld," said Hein of Save the Biltmore Preservationists Inc.
BELLEAIR - Five days after the owners of the Belleview Biltmore filed a request to raze most of the 115-year-old hotel, a national nonprofit is urging town leaders to deny that request. Local preservationists say they're gearing up for battle. They're booking TV interviews, passing out fliers and coming up with a game plan to combat rhetoric from the owners. Diane Hein, the head of a preservation group, said they're trying to get residents to come out to Tuesday's city meeting, where the Biltmore will be discussed. People see pictures of the hotel's rusted railings, chipped paint and tattered roof and lose hope, she said. "We need to get the message across that all of these things can be repaired," Hein said. The Save the Biltmore Preservationist seven foot Christmas tree combines the old with the new. The Belleview Biltmore Hotel opened during the Victorian era in 1897, and a popular Christmas decoration at that time was the beautiful cone-shaped ornament, the cornucopia. The Save the Biltmore hand-crafted cornucopias included decorations of pine cones, silver and gold leaves, miniature craft pearls, apples, pears, gold and silver-coated nuts, foil, ribbon, and other Christmas decorations. Half of their ornaments are adorned in the center with a photo representation of their nonprofit's Belleview Biltmore 14 karat gold jewelry charm to represent the "charm of the Belleview Biltmore." The top of their tree has larger gold printed images of their charm, and you can see the hotel's distinctive chimney stacks. It took the organization approximately 65 hours to make and decorate the cornucopias and tree topper. 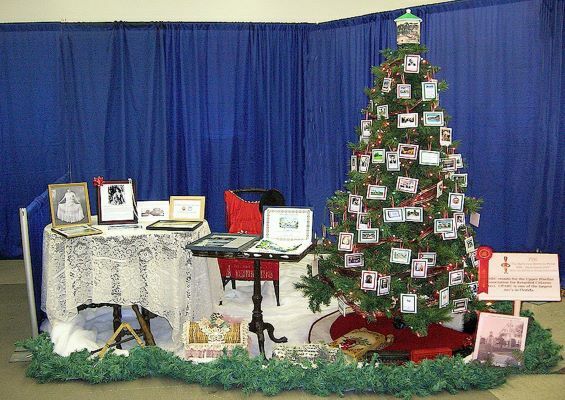 The tree was on view at the Festival of Trees show at Westfield/Countryside Mall sponsored by the UPARC Foundation show the end of November. BELLEAIR - The 112 year old Belleview Biltmore Resort's closing was bitter sweet. Some of the hotel's last events were attendance record breakers--mainly a family friendly Victorian picnic, Sunday's brunch and a fundraiser benefitting the Upper Pinellas County Retarded Citizens later that night. Optimism was up for the largest wooden structure in the world's 100 million dollar renovation project which is expected to take several years to complete and will adhere to the United States Secretary of Interior's Standards for Rehabilitation. Diane Hein who heads up the Save the Biltmore preservationist group voiced concern over the structure's physical well being, but looks forward to its future. 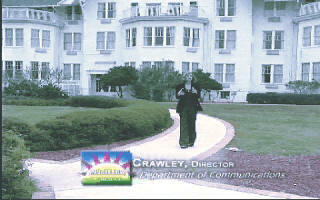 She said that she and vice president Ed Jameson and secretary/treasurer Doug Mann are "Overjoyed that the future of the Belleview Biltmore Hotel is secure now" and reminded that "everyone has to be aware that the hotel will be vacant and we hope that security will prevent any untoward events from occurring…We look forward to keeping abreast of the progress of the renovations over the next three years.. .We will miss the Biltmore's lovely buffets, the historic Victorian charm, the long walks through the two miles of corridors, the many gables and chimneys and especially the Christmas holiday decorations and ambiance." Click link for video and full text. Our Save the Biltmore Preservationist vice president Ed Jameson was interviewed for this video segment. 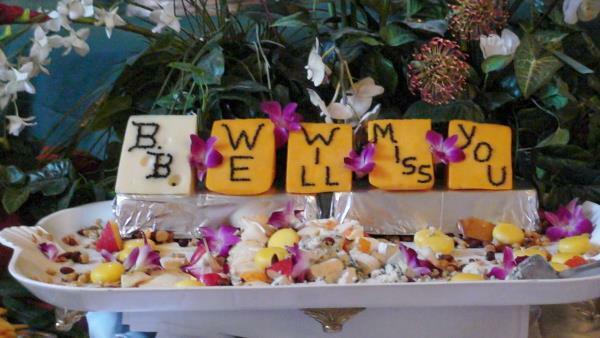 BELLEAIR - A piece of Bay Area history is about to close its doors. The Belleview Biltmore is one of the oldest wooden structures in the U.S. and is among 168 historic treasures that have been identified since 1988. "It's the root of Pinellas County history. It had all the movers and shakers of the people really had influence on the 19th century," said Ed Jameson, the Vice President of Save the Biltmore Preservationists. "It made people aware of Pinellas County." 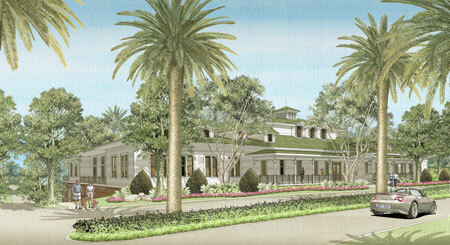 A schematic design depicts the proposed Belleview Biltmore Cabana Club in the Sand Key area. CLEARWATER – Five Sand Key-area residents are hoping that the third time is the charm. After losing at Clearwater’s Community Development Board and in an administrative hearing, they have filed an action in hopes that a three-judge panel from the 6th Judicial Circuit will prevent the owners of the Cabana Club from building a six-story, 38-room Victorian-style “boutique hotel” and a new, 165-seat restaurant on the land that they lease for their current restaurant. Belleview Biltmore Spokeswoman Amy McGuire feels that the city should welcome the project because it will provide both temporary construction jobs and permanent jobs in the restaurant and hotel. Nobody knows exactly how long it will take for the court to issue its final ruling. “Depending on the first few steps, it could be six to eight months,” McGuire said. Belleview Biltmore’s nonprofit organization, Save the Biltmore Preservationists, created a Belleview Biltmore Hotel holiday Christmas tree for the 2008 Festival of Trees in Clearwater. This was their first entry. The Biltmore tree won a second place red ribbon in the seven-foot tree division for hand-crafted ornaments. The tree had 55 ornaments on it with photos depicting the historic journey of the Belleview Biltmore Hotel from 1896 when it was built to the 2012 proposed renovations by the new owner Legg Mason Real Estate Investors. The Biltmore tree took about 60 hours to complete including the unique, hand-crafted tree topper gazebo that illuminates three historic views of the hotel. Next to the tree were displays of other Biltmore memorabilia, antique photos, furniture, a history of the hotel and some vintage apparel from different eras, which add to the theme of the tree. "The Belleview Biltmore Hotel 1896-Renovated 2012" Christmas tree, decorated by Save the Biltmore Preservationists and depicting the historic journey of the Biltmore, earned a second place ribbon at Clearwater's Festival of Trees. 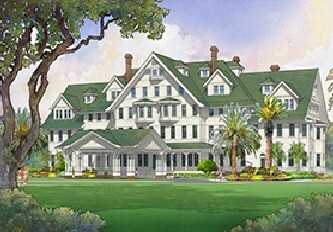 The historic 1897 Victorian-style Belleview Biltmore Resort & Spa was saved from demolition because of widespread Tampa Bay community support both inside and outside of Belleair, Belleair commissioner support and G. Michael Harris finding buyer Legg Mason Real Estate Investors, which will return the "White Queen of the Gulf" to its original splendor. Unfortunately, three historic Pinellas County properties have been demolished over the past two years, another will be partially demolished and one other building's fate is in question. History once demolished can never be recreated. In February 2008 Pinellas County established a countywide historic preservation program and declared historic preservation as public policy. Pinellas County can slow demolition of historic buildings once a historic preservation ordinance is passed. However, people need to be aware that this depends upon the acceptance of the Pinellas preservation ordinance by each individual city, in a timely manner. Citizens need to contact their representatives to ensure their cities agree to historic preservation. Otherwise, more of Pinellas County's history will fall under the wrecking ball of development. If one of your valuable historic structures is under threat of demolition in your city, contact local preservation societies, speak out at city commission meetings, and if necessary, start a grass roots effort and organize a nonprofit organization with a Web site to try to save a building from demolition. We encourage Tampa Bay residents to further participate in saving our valuable history. 1. 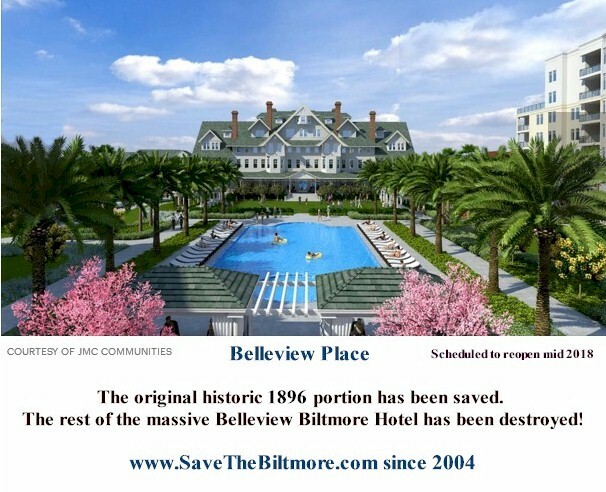 A Landmark Hotel is Saved - The final Belleview Biltmore renovation plans proposed by the new owner, Legg Mason were unanimously approved (with some minor changes) by Bellaire town officials on May 20, 2008. The project will include replacing the Japanese pagoda-like entrance to more of its original Victorian look; a new East wing separate hotel will be three stories instead of four but extended by 30 feet wide; more meeting, convention and ballroom space; a new poolside café, a new spa and a new underground parking garage. Congratulations to Diane Hein and all the "Save-the-Biltmore" preservationists. "We're preserving a legacy for future generations," said Joe Penner, managing director for Legg Mason Real Estate Investors of Los Angeles. Legg Mason paid nearly $30.3-million for the landmark in June. 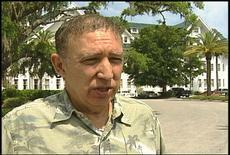 Penner predicted the restored hotel will one day be a five-star resort, "one we can all be proud of." Richard Heisenbottle, president of Heisenbottle Architects of Coral Gables, said there would be selective demolition "of noncontributing structures." When he announced that the pagoda- style lobby built in the 1990s was on the hit list, the crowd cheered and applauded. Heisenbottle described a "grand entrance" with palm and shade trees, fountains and a Victorian-style porte-cochere. The lobby will be a "soaring three stories" and built in traditional Victorian style. Ed Jameson, vice president of Save the Biltmore Preservationists, applauded the developer's plans, but worried about closing the hotel for up to two years during renovations. "Hotels and other vacant property can be more vulnerable to damage from fire, gas, water, electrical, hurricanes and vandalism during renovations," he said. He suggested either the town or Legg Mason provide 24-hour, round-the-clock security for the property. After the presentation, Belleair Commissioner and local architect Stephen Fowler praised Heisenbottle's presentation and his award- winning firm, which has been praised by the National Trust for Historic Preservation and Florida Trust for Historic Preservation. Inside Pinellas streaming video. The Biltmore segment is about five minutes into the show. Now that the Belleview Biltmore Resort and Spa is saved, the nonprofit organization, Save the Biltmore Preservationists, Inc. will work towards promoting and preserving this beautiful Victorian hotel both in and out of our community. Save the Biltmore Preservationists is offering a variety of memberships that will enable them to continue to preserve and promote the Biltmore in the future with your help. Save the Biltmore has been dedicated to saving all four wings of the Belleview Biltmore Spa and Resort since 2004 and will continue do so in the future. In saving the golden treasures of the past, we bank on enriching the present and the future. To find out more visit http://www.savethebiltmore.com. Note readers: Bay News 9 interviewed Ed Jameson, our vice president of our nonprofit organization, Save the Biltmore Preservationists for their TV news segment June 24, 2007. Here is their online article. New ownership has big plans for the Belleview Biltmore, which has stood for more than a century. A symbol of Tampa Bay will continue to stand, looking over the water as it has for more than a century. It's been a fight for the past few years for preservationists. And now that the Belleview Biltmore Resort is under new ownership, they're boasting with relief. It's a victory for those who fought a hard fight to save a piece of history. "It's been a place where people could come with their side cars from the railroad," Save the Biltmore Preservationist Edward Jameson said. "It was just a resort of the ages in the 1890s." The Belleview Biltmore resort was threatened with demolition until this past week, when a new real estate investment group bought the property. Jameson has been a great part of the effort to save the Biltmore. Preservationist Edward Jameson said the Belleview Biltmore was the place to be in the 1890s. "We've heard that they would be replacing that pagoda. And they would also be adding maybe a convention center and doing some other changes for the hotel," Jameson said. "It all sounds very positive." The fight that began in 2004 is finally over, and preservationists hope to restore the Biltmore to what it was in its hey day. "It's the root of Pinellas County history," Jameson said. "It's where the movers and shakers of the 19th century came." 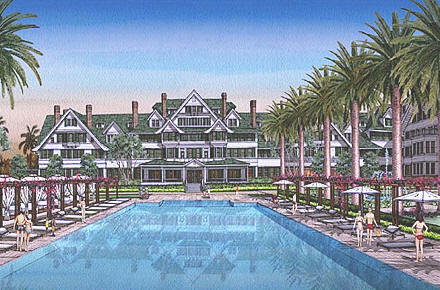 The Belleview Biltmore sits at the water's edge in Belleair. 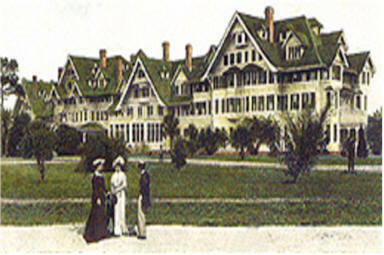 The resort, which includes a golf course and spa, was built in 1897. The Belleview Biltmore Resort and Spa has been purchased by Legg Mason Real Estate Investors. 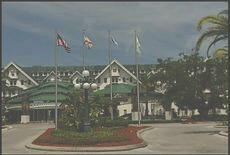 BELLEAIR – The historic Belleview Biltmore Resort is now officially under new ownership. Principals of the buyer, Legg Mason Real Estate Investors, and the seller, Belleview Biltmore Resort Ltd., wrapped up the exhaustive process of completing the massive amount of paperwork involved in the transaction late in the day on June 20. BELLEAIR – Located in an area that many say is losing its charm to over development, the Belleview Biltmore has stood as an ageless symbol of beauty, style and casual elegance. With developers eyeing the classic hotel for possible demolition, one tiny, classically elegant piece of jewelry may play a role in its salvation. The piece is a charm, a decorative pendant which has enjoyed periods of popularity in the form of a charm bracelet. 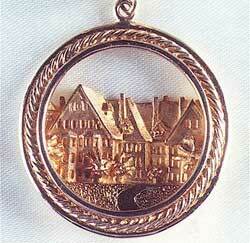 Charms were collected to capture memories of treasured life experiences … places visited, associations, relationships. It is said that Queen Victoria wore charm bracelets. Prices set for the hand crafted charms are $75.00 for sterling; $100 for gold over sterling vermeil; and $400 for 14kt gold. 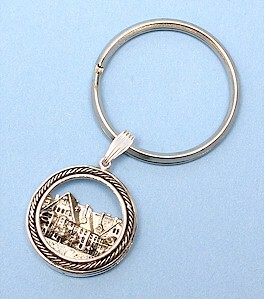 Charms may be viewed and ordered at our online store. 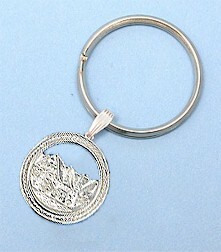 Since all charms are custom made to order, a time period of 4 to 6 weeks must be allowed for creation and delivery. Available at our online store. BELLEAIR – Local artist Tony Blue has created a series of eight beautiful, mixed media art pieces showcasing the Belleview Biltmore Hotel. He will donate 20 percent of sales proceeds to the nonprofit organization Save the Biltmore Preservationists. 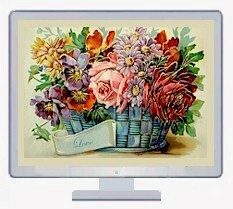 Blue is offering the art as limited edition (150 maximum) giclée prints on canvas. They come stretched, signed by the artist and numbered, mixed media and ready to frame. Photos of the remaining five of the series may be found at http://www.savethebiltmore.com/ and any or all of them may be purchased at the online store. Save the Biltmore bookmarks, year-at-a glance calendars, greeting cards fine art photography, are also being sold online to help raise money for the hotel’s preservation. 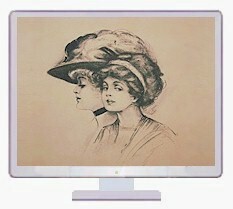 Click here to see the new posting of the beautiful Belleview Biltmore Hotel series by local artist Tony Blue. Total of eight. Photo courtesy of www.SAVETHEBILTMORE.com Supporters of the Belleview Biltmore Resort and Spa are delighted with passage of the town’s new historic preservation ordinance. 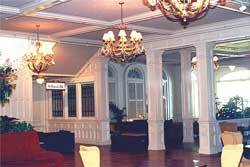 Photo courtesy of www.SAVETHEBILTMORE.com Features of the original lobby of the Belleview Biltmore are protected under provisions of the town’s historic preservation ordinance. "Regardless of the ordinance, Stroud and Belleair leaders claim the town's comprehensive plan, adopted in 1999, already protects the Belleview Biltmore, which is referenced about a dozen times. " Attorneys with expertise in preservation and municipal zoning laws are now advising town officials that they are on solid legal ground if they want to fight the demolition. Tearing down the hotel, they said, is contrary to the town's long-range comprehensive plan and therefore would not be allowed by law. "The city is not legally entitled to issue permits which violate its own comp plan," said Stephen Helfman, a Miami land use and zoning lawyer hired by the town. "She concurred with town leaders, who said existing town rules require an extensive review of the proposed demolition by officials and the public and that the town's comprehensive plan might not allow the hotel's destruction. The existing rules protect the Biltmore, Stroud said, but she added that it would be better protected with an ordinance that has the details and procedures for preservation outlined." ***Readers note: Thanks to the efforts of this Save the Biltmore nonprofit organization with this web site, we moved forward at the Belleair workshop meeting, October 4 2005, to make sure the interior of the Biltmore is protected as well as the exterior, a VERY important step to ensure that the historical charm that the inside will be preserved no matter who buys the hotel. An amendment was passed that will ensure protection of the interior of the hotel. We thank the commissioners and Mayor for their approving of this amendment. Diane Hein President Save the Biltmore Preservationists, commented before the vote, “I do hope that all of Belleair’s commissioners vote "yes" to pass it to show their support of saving the Biltmore Hotel. It will take 30 days for the ordinance to go into effect once passed, but preservation attorney Nancy Stroud has been quoted as saying that Belleair's Comprehensive Plan will protect the hotel from demolition.” Belleair’s planning and zoning meeting convened on the 18th, with the historic preservation board on hand. Attorney Stroud reviewed the changes previously recommended by board members and commissioners, including stronger language to protect the hotel interior’s most significant elements with regard to location, design, material and workmanship. Stroud incorporated language in the ordinance that will enable Belleair to become a certified local government, opening doors to preservation grants, preserving the town’s heritage and attracting historical tourism. According to the ordinance, Urdang will have to abide by the ordinance codes along with other historical property owners. One of which gives the town the authority to fine property owners who intentionally or inadvertently neglect historic sites. BELLEAIR - The preservation ordinance aimed at keeping the historic Belleview-Biltmore hotel from being torn down was passed by the Town Commission on first reading October 4, but a leading advocate of preservation still isn’t satisfied. Diane Hein, who led the fight to keep a developer from demolishing the hotel – the largest occupied wooden structure in the world - wants the Preservation Board to have enforcement powers. Nancy Stroud, the lawyer whom the town engaged for the specific purpose of handling matters related to the hotel issue once plans were revealed that it might be torn down, said she favored the commission being the final authority on preservation matters. Hein’s group had drummed up tremendous opposition to the DeBartolo’s group plans to demolish the hotel and build new residences. Blocking Urdang’s plans boils down to a race to the barn, so to speak, because once the preservation ordinance takes effect in mid-November it will trump any plans to tear down the hotel. The 25-page ordinance created by Stroud contains many elements including preservation of other historic homes and measures to prevent an owner of any designated historic structure from allowing the building to become decrepit through neglect. While it appears DeBartolo Development has backed off from its plans for a project on the site of the Belleview Biltmore Hotel, a rival bidder for the property is a threat also, according to Diane Hein, president of Save the Biltmore Preservationists. (please note THIS web site!) Hein makes it clear that her group is opposed to the total demolition of the Biltmore. She wants complete historical preservation of the hotel. A lawyer specially engaged for the purpose, Nancy Stroud, has formulated a preservation ordinance that will be coming before the Belleair commission next month. Hein points out that the Biltmore Hotel in Coral Gables is run as a successful hotel that has been extensively preserved through the efforts of a strong preservation ordinance. Other hotels in the country, she says, that are similarly run as successful hotels while being under preservation protection are Victorian Grand Hotel in Mackinac Island in Michigan and the Coronado Hotel in San Diego. READERS: We here at Save the Biltmore Preservationists are pleased that DeBartolo has backed off because their most recent plan was to demolish the north and south wings as of their presentation to Belleair last week. They backed off due to public pressure and lack of support by the town officials for their plans. My http://www.savethebiltmore.com/ web site has worked tirelessly to stop the total demolition of the Biltmore since April of this year, 2005. I actually put up this web site in December, 2004, when I first heard the Biltmore was to be demolished. I want to thank Biltmore supporters and Belleair citizens who attended town meetings and or wrote letters to help save the Biltmore over the past few months. Our group is for historical PRESERVATION OF THE BILTMORE BOTH INSIDE AND OUT! The Biltmore Hotel in Coral Gables/Miami, Florida is run as a successful hotel which has been extensively preserved through the efforts of a strong preservation ordinance giving many decisions to their historic preservation board. The Biltmore Hotel in Coral Gables, Florida does NOT have high-end condo/hotel units in their historic hotel!!! The historic Victorian Grand Hotel in Mackinac Island is run successfully with NO condo/hotel units! The Victorian Hotel del Coronado Hotel in San Diego and the Driskill Hotel in Austin, Texas is successfully run with NO condo/hotel units! Welcome to Save the Biltmore Preservationists, Inc., a nonprofit organization. A group of people dedicated to saving the Belleview Biltmore Hotel, all four wings and all guest rooms so this beautiful building remains a REAL historic hotel. We welcome volunteers interested in helping us save the Biltmore. We will NEVER own the hotel, and we are AGAINST any group that wants to put ultra modern hotel/condo units in the Biltmore that would require extensive remodeling and against anyone wanting to put condominiums around the Biltmore! To be on my Biltmore Update mailing list to receive news of the Biltmore and hotel events and activities Email me Diane Hein. 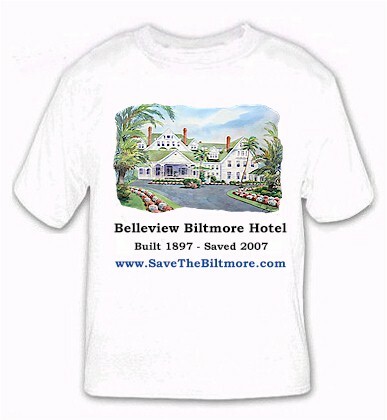 In December, 2004, Diane Hein, launched this web site, http://www.savethebiltmore.com/ after it was reported that the Belleview Biltmore was to be torn down. "I wanted to use this web site to help generate ideas to help save the entire hotel. Fortunately there was enough public support voiced that this did not happen, and the Biltmore was spared the wrecking ball! I love historical buildings and artifacts, hence my interest in saving the Biltmore. "On April 12, 2005, The St. Petersburg Times newspaper published an article indicating that the Belleview Biltmore AGAIN was under contract to be sold and destroyed. They mentioned this web site, http://www.savethebiltmore.com/, as I had kept it up and running, as I felt that it would only be a matter of time until another attempt would be made to destroy it. My worse fears came true. Honeywell and Urdang had a contract to sell the Belleview Biltmore to the DeBartolo group and put condos in its place and possibly another hotel. For nine months with much public support and the efforts of this web site, the Biltmore has been spared demolition. "My personal vision, along with my late husband and our nonprofit vice president, Ed Jameson, would be to have the Belleview Biltmore as a world class golf, tennis and tourist resort. We could include more museums inside, woodworking and stained glass artifacts, classes and stores, to pick up on the fact that the Biltmore is the largest continually occupied wooden structure in the world. (The Biltmore has an authentic glass Tiffany ceiling in the Tiffany ballroom.) We could include a Victorian lobby, Victorian decorated rooms for a higher price, beautiful gardens for people to walk around in and then later they could enjoy afternoon lunch or tea on Biltmore's lovely out door veranda. A recent article in the St. Petersburg Times newspaper indicated that people are wanting more historical sites to visit, so the Victorian Biltmore would have a grand future ahead of her! And with Baby Boomers heading into retirement, they will want to go to historic places even more. So how about it Supporters and friends of the Belleview Biltmore, this is the perfect opportunity for YOU to help us promote the Belleview Biltmore so that tourists have a historical place and perhaps all kinds of interesting museums inside the Biltmore to visit right here in Florida! 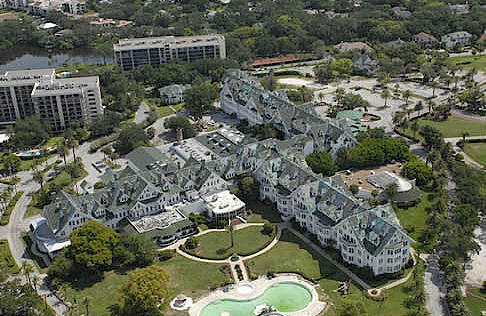 "Now that the Biltmore is saved, the purpose of this web site is to gain community, county, state and national awareness and attention to promote and preserve this historic Victorian hotel, the Belleview Biltmore Hotel, largest continuously occupied wooden structure in the world, built in 1896, Belleair, Florida, Pinellas County. The Belleview Belleair Biltmore Hotel was built in shingle architectural style, Queen Anne, by Henry Bradley Plant and is on the National Historic Register. Many famous dignitaries have been guests at this hotel including President George Bush, President Jimmy Carter, President Gerald Ford, the former King of England, (the Duke of Windsor) the Vanderbilts, the Pew family of Sun Oil, the Studebakers, the DuPonts, Thomas Edison, Henry Ford and Lady Margaret Thatcher. "Join us and become a member to help preserve and promote the Biltmore. 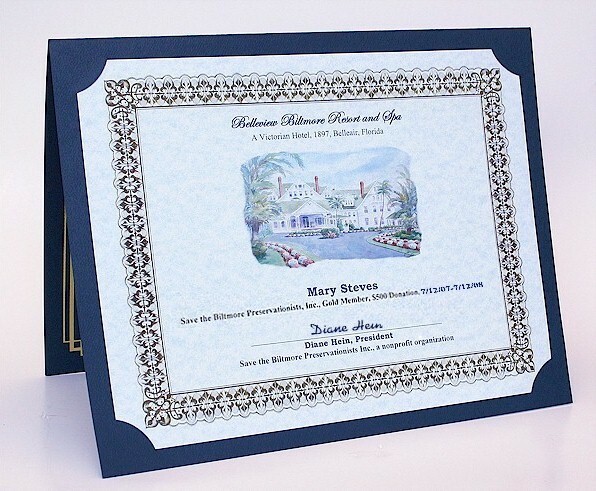 Memberships include beautiful gifts and a certificate." The Belleview Biltmore Hotel was placed on the National Register of Historic Places in 1979. It helps qualify the hotel to receive historic tax credits for any renovation plans. I have received many emails for this web site as a result of many media publications so I want to thank all of them for mentioning http://www.savethebiltmore.com/. 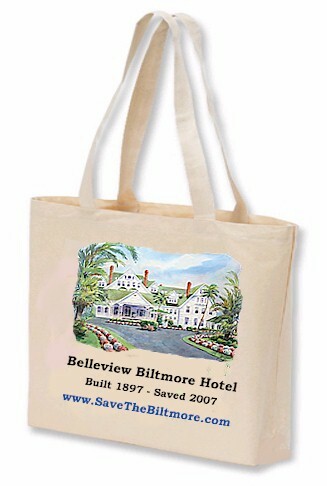 I also want to thank everyone who who emailed their support at this web site to save the Belleview Biltmore Hotel. May everyone who loves this historic hotel join together to preserve it now so that it will be saved for our generation and for future generations to come. If you would like to be on the mailing list to receive current events information and Belleview Biltmore Updates about the Biltmore, just click Belleview Biltmore Supporters Mailing List and I, Diane Hein, President of Save the Biltmore Preservationists, will add your name and email address to my mailing list. In saving the golden treasures of the past, we bank on enriching the present and the future. We are not just saving a hotel, we are saving history! To see more cartoons from 2005 when the Belleview Biltmore Hotel was under threat of demolition, click drawing above, there are 5 total. Below is a newspaper article from the St. Petersburg Times, April 12, 2005 relating to the destruction and preservation of the Belleview Biltmore Hotel; it is in this article that this web site, http://www.savethebiltmore.com/, was first mentioned in the news media. A company that planned to raze the Belleview Biltmore last year and build condos has the property under contract. 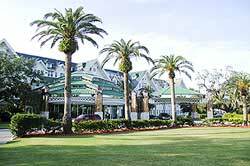 The Belleview Biltmore Resort & Spa was opened in 1897 by railroad magnate Henry Plant. 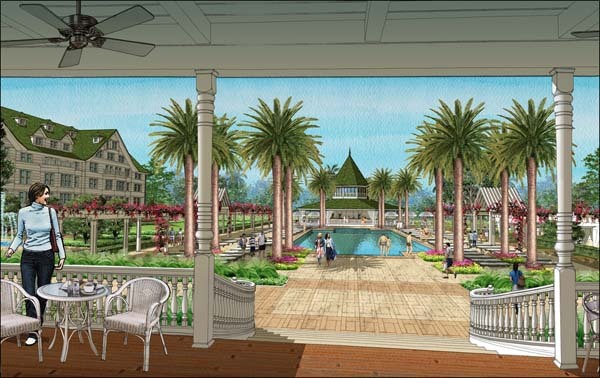 BELLEAIR - The developers who tried to raze the Belleview Biltmore Resort & Spa and replace it with condominiums last year have the property under contract again, the company said Monday. This time, however, the Tampa developers are not revealing their plans for the 19th century landmark. DeBartolo Development, a company that primarily builds shopping centers, has had a deal in place for almost two weeks to buy the 244-unit resort, said Jay Adams, the company's development officer. But no one from DeBartolo or the resort's current owners would discuss terms of the proposed sale or the future of the 160-acre resort, which includes a golf course and beach club. "I can verify we do have it under contract," Adams said Monday afternoon, referring other questions to the company's president, Ed Kobel. Kobel did not return messages Monday. DeBartolo was part of a group last year that proposed demolishing the hotel and replacing it with hundreds of condominiums, an idea that infuriated many residents in the small waterside community. That plan flopped in January after developers said they could not win public support for the project. Whispers of a second proposed sale swirled through Belleair over the weekend. Many residents have already promised another vociferous fight if plans include scrapping the historic hotel. For their part, town officials said on Monday they were again left in the dark. None of Belleair's five commissioners had heard a deal had been struck; they were upset the last time when they read about the potential sale of their most prized asset in the newspaper. "I hope it's not true," said Commissioner Gary Katica. "It's such a part of this town I would think the people of Belleair would be in an uproar." "It's going to stir up a lot of people," Commissioner Ernst Upmeyer said. "Basically, I have a great love for that building and I would hate for anything to happen to it." Further fueling speculation about the hotel's fate, a local construction company asked the town last week about the procedure for demolishing a commercial property, though it would not say what it was. 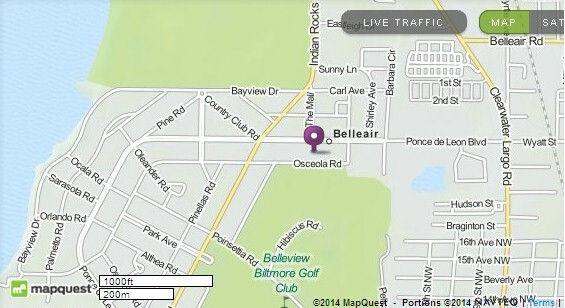 The town of Belleair, which is about 2 square miles, has just a handful of commercial properties. The company, Cross Construction, would not discuss the project it is researching. "That question should answer itself in a couple of days," said Dwight Hopkins, a representative. An executive with the resort's current owners, Urdang and Associates, a Pennsylvania investment management firm, said Monday the firm does not comment on individual investments. Honeywell Inc., one of the larger shareholders in the Biltmore, said in a statement that decisions are made by the Pennsylvania company. Richard Wilhelm, who runs the hotel, did not return calls seeking comment. Former Town Commissioner Connie Mudano said it would be a tragedy if developers bulldoze the hotel, which was placed on the National Register of Historic Places in 1979. "This is a very valuable building. It's the center and soul of the town of Belleair," Mudano said. "It's the reason that Belleair exists." Built by railroad tycoon Henry Plant and opened in 1897, the 820,000-square-foot Belleview Biltmore is regarded as the largest occupied wooden structure in the world and is one of Florida's few remaining historic hotels. Presidents George Bush, Jimmy Carter and Gerald Ford have all been guests, as have baseball legends Joe DiMaggio and Babe Ruth. The Duke of Windsor once wintered there. But more recently, the resort has struggled to stay afloat financially. While managers have consistently said the hotel is solidly booked, some employees have said otherwise. In fact, the property has a history of steep losses for past owners. Atlanta hotelier Salim Jetha, who bought the hotel for $16-million with his family in 1997, said a year later they were losing $228,000 a month. Mido Development, the Japanese ownership group before that, at one point was reportedly losing more than $400,000 a month on the property it bought for $27-million. Last month, a judge ordered the resort's owners to pay $36,000 to three companies - including the Tampa Tribune - it had neglected to pay. Brad Cranston, who runs a temp agency, said resort managers gave him the runaround when he tried to collect the $13,012 the resort owed him. "They were pretty much playing games with me," said Cranston, franchise owner of Adecco Employment Services, which had at least three people working at the hotel for three months starting in April 2004. Cranston took the resort to court. He said his company received half the money Monday morning. Click Newspaper and Publication Articles to read many, many more articles. © Copyright 2008 SaveTheBiltmore.com All Rights Reserved. .